Blessed at last with a warm and sunny day, on Sunday 2nd June 2013, Shoreham was very proud and pleased to welcome some veterans of the Battle of Britain who served in the air and on the ground. 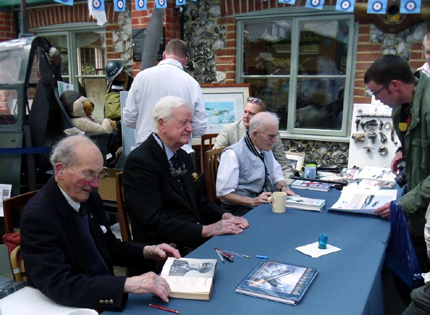 Squadron Leader Nigel Rose, Wing Commander Tom Neil DFC & Bar and Chief Technician Joe Roddis, delighted Museum visitors of all ages by signing personal items and recounting tales of their varying RAF experiences. If you couldn’t make it on the day, we still have a small number of commemorative prints available for £37.50, including P&P. 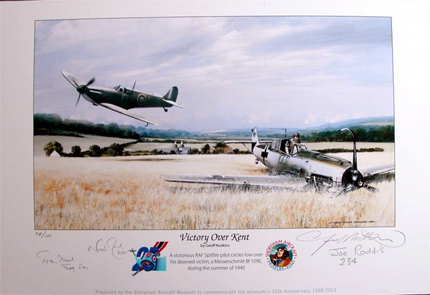 Each print is individually signed by our three veterans. If you would like to purchase a print, please call us on 01959 524416. 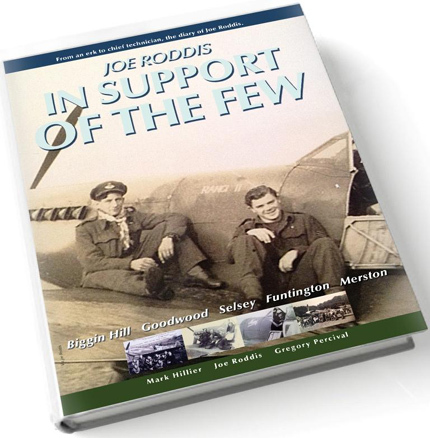 You are currently browsing the Shoreham Aircraft Museum – News archives for June, 2013.